Truganina Swamp is a 175 hectares wetland, comprising grasses, salt marsh and sedges, is fed mainly by water from Laverton Creek, which originates in Truganina. Truganina Swamp provides habitats for 2 endangered species – the Altona Skipper Butterfly which feeds on Chaffy Saw Sedge and the Orange-bellied Parrot which feeds on Beaded Glasswort and Scrubland species Glasswort. The wetland is an important habitat for many migratory wading birds and fishes. The site is archaeologically important as it used to be frequented by Koories from the Woiworung and Bunurong tribe who foraged the area for its variety of animals, fish and plant food. Historically, Truganina Swamp was a terminal swamp with no defined outlet to Port Phillip Bay. With expanding urban development in Altona, the swamp was acquired by the Board of Works (now Melbourne Water) in 1961 for drainage and flood mitigation. The Laverton Creek channel was constructed to drain water to the Bay and widened to increase its capacity for carrying floodwater. A levee bank was built on the eastern side to protect the adjacent residential areas from floodwater. The Truganina Swamp became a haven for motorbike and trailbike riders and a dumping ground for cars and industrial rubbish. The Friends of Westona Wetlands were formed in 1993 and had persuaded Melbourne Water to install a fence to keep out illegal traffic and prevent access to ecologically-sensitive areas of the Swamp. This environmental group also worked with local companies such as Hoechst Chemicals (now Qenos) in constructing a bridge (from a disused walkway) in 1997 over the Saline Pond drain near the adjacent Port Phillip Retirement Village and Dow Chemicals in constructing a bird hide in 1998. The bird hide can be accessed from the entrance to Truganina Swamp on Bell Avenue. 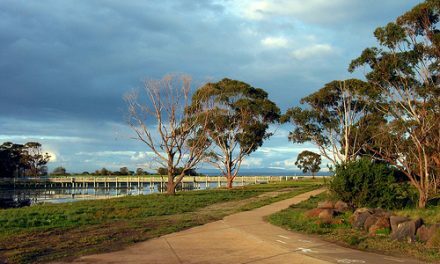 A walking and cycling trail encircles the swamp and links to the Hobsons Bay Coastal Trail across Queen Street.